As part of global celebration of the 60th anniversary of Chinua Achebe’s Things Fall Apart, Nigerian-American artist based in Washington, DC, Victor Ekpuk, will hold an exhibition featuring artworks used as book cover books, including TFA, in the United States. The exhibition will hold at the Smithsonian National Museum of African Art on March 15, 2018. The event will also feature a panel discussion featuring Prof Nwando Achebe – Jack and Margaret Sweet Endowed Professor of History at Michigan State University – Ekpuk and others. Ekpuk’s art reflects his experiences as a global artist. “The subject matter of my work deals with the human condition explained through themes that are both universal and specific: family, gender, politics, culture and Identity” says Ekpuk on his works. 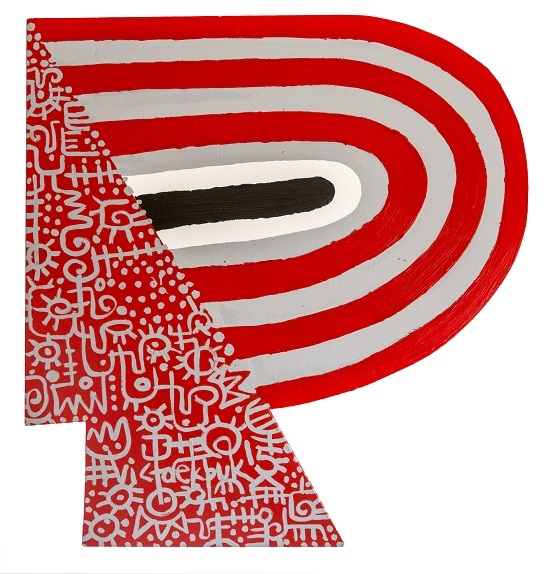 Guided by the aesthetic philosophy nsibidi, where sign systems are used to convey ideas, Ekpuk re-imagines graphic symbols from diverse cultures to form a personal style of mark making those results in the interplay of art and writing. African art has come a long way since Picasso saw the 1907 exhibition of African objects in Paris’ Trocadero Ethnographic Museum. What had been regularly relegated to museums of anthropology now has its place in the hallowed halls of art museums. Witness the entire first floor of the East Building of the North Carolina Museum of Arts now completely devoted to the art of Africa. The story of art scholars and their ignorance about work from Africa goes back to the early days of colonialism when explorers and conquerors brought African objects back to Europe as souvenirs. If the objects were made from important materials like ivory, gold and silver they would be shown next to Western paintings and sculpture and curiosities from the animal and mineral world. Meaning was ignored — only ownership was important. In the 19th century, as if colonization and slavery had not destroyed any regard for the worth of African objects, there was also the scholarly classification that divided art and science and the natural from the human-made world. It was then that African artifacts ended up in ethnographic museums, where they were shamefully mislabeled. There was no scholarship to distinguish the artistic differences between the countries of Africa or for that matter between Africa and Southeast Asia. Since the 1950s Africa has found its way into most art museums, but always seemingly out-of-place wherever it landed. That will no longer be the case at our state museum. The African collection will have an entire floor of the old (East) building and while it is separated from the main collection it definitely has a position of honor. At a press preview I saw John Coffey, deputy director for art and curator of American and modern art, and Linda Dougherty, chief curator and curator of contemporary art, standing together and asked them how long the staff had been thinking about what would be the best way to make the East Building equal in importance to the new West Building even when there were no special exhibitions. “A very long time,” they answered in unison. When I asked if it had been an “Aha” moment to house the African collection there, they said that decision came because African materials are constantly being acquired and the East Building has the perfect lighting controls to safely display such fragile artifacts as fabrics and costumes, key parts of African heritage and art. At the end of the first floor, above the stairway, is a stunning “Masquerade Costume.” Beside it is a video of a dancer wearing the costume, calling attention to the use of the costume and to the patrons who bought the fine fabrics to create this extravagant object. It also reminds the audience that the art of Africa is a vibrant part of a human community and was never meant for display only. Just behind the stairwell is the core of the collection which spans 16 centuries and was created by a complicated and sophisticated society. Included are contemporary works, a palace door, masks and some pristine posts created to glorify special spirit gods. The posts were commissioned for a cultural center in Nigeria but were never used and come to the museum’s collection in untouched beauty. The exhibition includes gold objects, usually communally owned, and a “Seated Male Figure,” c. 600, which is from a group of the oldest known ceramic figures of Western Africa, and is the oldest piece in the collection. Among contemporary works are a chalk drawing by Nigerian-American Victor Ekpuk made especially for this installation, Ghana-born El Anatsui’s large textile-like sculpture made of discarded aluminum and copper wire, which was a commission for the museum when the West Building opened, and Yinka Shonibare’s “Eleanor Hewitt” 2005, a fiberglass mannequin standing on stilts high above the crowd. Most of the objects were created in the 20th century and are tradition based and can only be understood in the context of their use. For instance, the mask is always worn in a performance that carries on ancient traditions. An ongoing area will be devoted to North Carolina collections and the first to be included are objects given to Bennett College by the estate of Warren M. Robbins, founder of the Smithsonian’s National Museum of African Art. One fine example is a delicately beaded skirt with a multiple diamond design in variegated colors. A large space is devoted to interactive experiences where visitors can try their hand with techniques used by the African artists, like weaving on a floor-to-ceiling loom threaded with yarns from North Carolina sheep and goats. With this collection now front and center, we must imagine each piece as playing a vital role in a human community — that the masks, for example, are not sculptures made for glass cases but were part of sacred ceremonies performed as a glorification to a god or spirit or to mark significant rites of passage. This material covers an entire continent and, as visitors, we can see the expertise of the artists and how they differ from region to region; the fabrics on display give us a tiny glimpse into the originality of patterns that came from these areas. And all this beauty and craftsmanship flourished in spite of colonialism and slavery. To my mind, the stars here are the drawing by Ekpuk and the sculpture by Anatsui. Ekpuk’s drawing shows an abstract figure cradling graphic symbols from diverse cultures in his arms, combining writing and art. Anatsui’s sculpture folds and undulates like fabric, but is made of metal bottle tops sewn together with copper wire. They have found their Africa with a contemporary voice. When she contacted artist Victor Ekpuk in 2015 about creating a “site-specific” chalk drawing for the North Carolina Museum of Art, African art gallery curator Elizabeth Perrill didn’t know what the finished product would look like. Neither did Ekpuk, until he arrived at the museum earlier this month. He entered a gallery still in progress as the museum has spent the past six months readying a larger space for its African art collection. 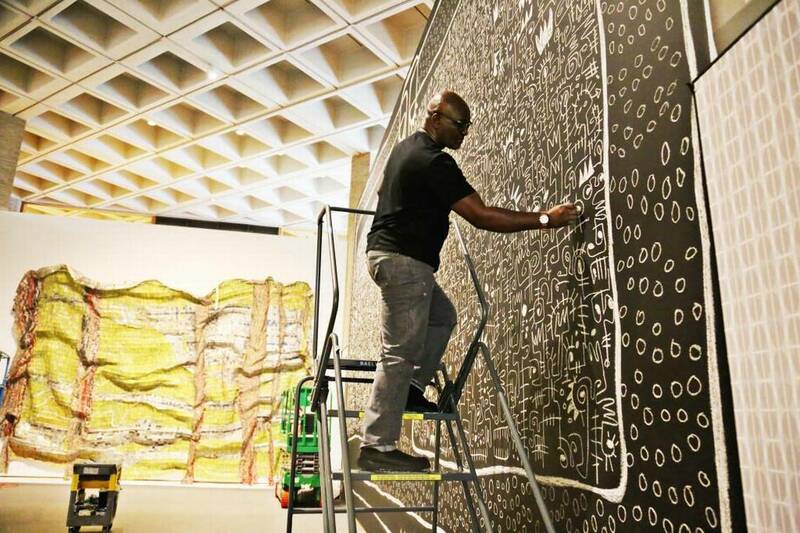 The Nigerian-born Ekpuk’s chalk drawing on a 30-by-18-foot section of wall will be a temporary centerpiece for the gallery, which opens to the public on June 30. Before he started the drawing, which incorporates Nigerian ideograms, or symbols representing ideas, Ekpuk examined the items that will surround his piece: a terra cotta figure formed circa 600, a beaded mask from the Ha people of Tanzania, contemporary photos of life on the continent. In his drawing, titled “Divinity,” a large figure appears to be holding the symbols, which take up most of the wall. The museum’s Facebook Live video of Ekpuk working on “Divinity” received almost 2,000 views, said museum spokeswoman Karlie Marlowe. “He’s bringing [the gallery] literally up to now and bringing in the idea of memory and of the African diaspora that comes right here to North Carolina,” said Perrill, the gallery’s curator, who also teaches art history at the University of North Carolina-Greensboro. The old African gallery closed in December. NCMA moved the collection from its West Building, where an average of 65 pieces could be on display, to a gallery in its East Building three times that size. Visitors will see about 125 pieces in the new 6,500-square-foot gallery. 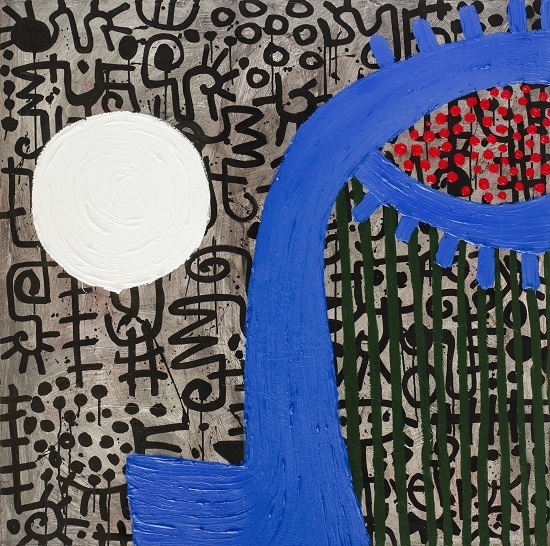 The museum will display more contemporary and modern art in the African gallery’s old space. The East Building has fewer windows than the African art gallery’s previous home. This allows museum staff to control the amount of light on sensitive textile pieces, like a red, black and tan “man’s prestige hat” from Cameroon. The piece had been in storage since 2002. A $500,000 endowment from the William R. Kenan Jr. Charitable Trust made the gallery’s move possible, Wheeler said. “This grant allowed us to do extensive audience research that we’ve never been able to do to find out why do people come to the museum and how they like to experience art,” said Michelle Harrell, the museum’s director of teaching and learning. Research showed visitors enjoyed hands-on activities, so when the African art gallery opens, visitors of all ages can create art of their own at an interactive station. They’ll learn about Kuba cloths, geometrically patterned textiles from central Africa, and make their own renditions with yarn and plastic embroidery looms. The gallery has a wall dedicated to items on loan from North Carolina collections. Pieces from Greensboro’s Bennett College, a historically black women’s school, will be on view for about a year. The museum’s conservation team spent the six months that most of the African pieces were off view cleaning and repairing them. Conservation assistant Stacey Kirby recreated raffia costumes to display beneath some of the masks in the center of the gallery. Museum staff members are noticing many pieces in the new gallery for the first time, even though the pieces have been in the collection for years, Perrill said. Ekpuk’s chalk drawing will only get attention for a year – he stipulated that it must be erased in June 2018. Erasing the “ephemeral drawings,” as he calls them, is their completion. Hours: 10 a.m.-5 p.m. Tuesday-Thursday and Saturday-Sunday, 10 a.m.-9 p.m. Friday. Closed Mondays. Admission: There is no charge to visit the museum’s permanent collection in the East Building, where the African Art gallery is located. Admisson is charged for some special exhibitions and workshops. ▪ There will be a panel discussion on Contemporary Diaspora Art at 7 p.m. on July 20 with Nigerian artist Victor Ekpuk and other artists of African descent, moderated by Richard J. Powell, the John Spencer Bassett Professor of Art and Art History at Duke. Tickets are free, but required. ▪ While the new African art gallery opens on Friday, June 30, the museum has scheduled a large opening celebration for Sept. 23. “Threads of Africa: A Celebration of Art, Nature, and People” will be a daylong celebration with music and dance performances, drum-making workshops, collaborative community art activities, food and African cultural activities and a free concert by West African artist Angélique Kidjo in the museum park that evening. Kidjo’s concert is free, but tickets are required; they’ll be available Aug. 1. ▪ “Inspiring Beauty: 50 Years of Ebony Fashion Fair” which runs Oct. 28 to Jan. 21. These Moments marks VICTOR EKPUK’s third solo exhibition at Morton Fine Art. 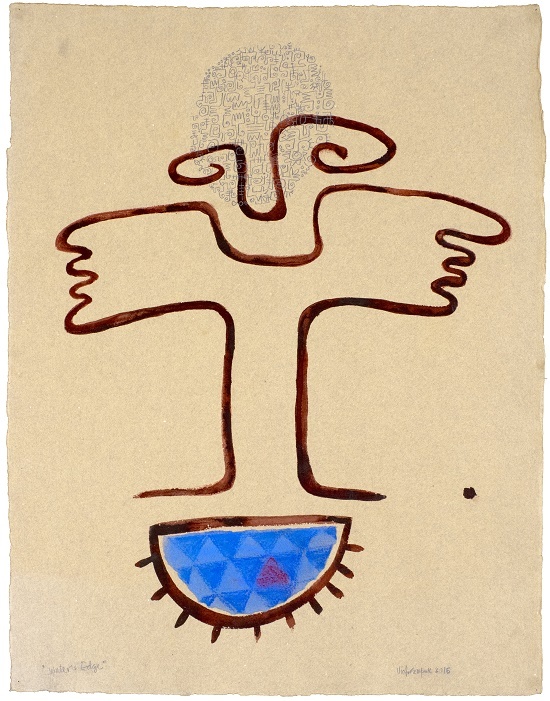 His artwork is included in the permanent collections of the Smithsonian Institution Nation Museum of African Art, Brooks Museum, Krannert Art Museum, US Department of State, Newark Museum, Arkansas Art Center, Fidelity Investments, The World Bank, and University of Maryland University College Art Collection.